The Marine Corps Birthday is still a few weeks away, but the service extended one tradition tonight by posting its annual birthday video message. Featuring narration by Commandant Gen. Jim Amos and Sgt. 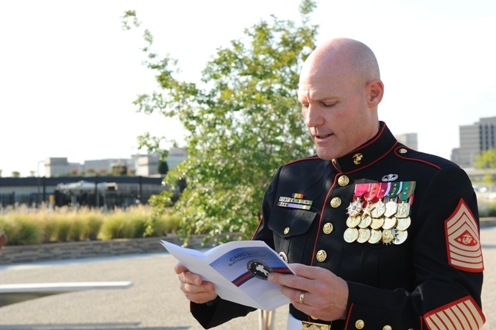 Maj. Mike Barrett, the Corps’ top enlisted Marine, it honors Marines everywhere, with special appreciation set aside for those who served in World War II and since the attacks on 9/11. 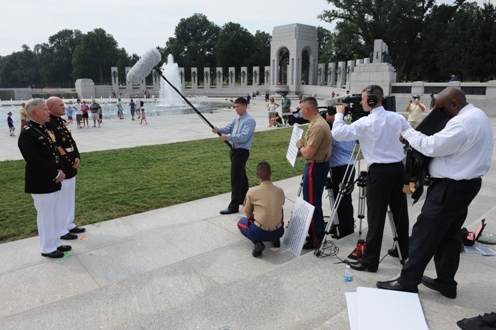 The commandant and sergeant major filmed pieces of the message in New York City and in the Washington, D.C., area at both the World War II Memorial and the Pentagon. They also filmed part of it in Marjah, Afghanistan, on Sept. 11. 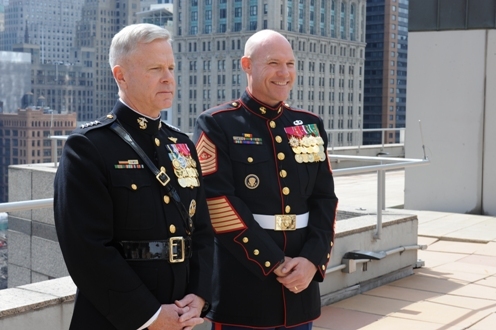 My ten years in the Corps have taught me that Marines are a true example of a brotherhood and as a member of the 1st MarDiv Association, both locally and nationally, we carry on that tradition even as inactive Marines. Semper Fi, Devil Dogs and may your flag forever fly over our land as a sign of safety and freedom. Oohrrah! Very good job in Homering the men and women who have served our Country and our Corp. Happy Marine Birthday to you and all Marines everywhere. Freedom will never be Free. Raul Mendoza Proud Dad Of A United States Marine. Puts tears in this old Marines eyes! Semper Fidelis & HAPPY BIRTHDAY!!! Awesome Job Bro! Brought tears to my eyes! Happy Birthday to all the Marines past and present! Happy Birthday Marines. Stand tall. Semper Fi. That really does make a Marine feel proud. I have to say that I, along with all my Marine friends would have done the same thing. Once a Marine, always a Marine. I have never met a Marine that wasn’t proud of the title and made certain everyone knew he was in the Corps. Some of the other service members are almost apologetic when they discuss where they served. Marines don’t have that problem. God bless and protect you, everyone of you Grunts. I’m proud to be a just a part of the naval service with the United States Marines. Semper Fi! Happy Brithday Leathernecks! Semper Fi To all of my brothers that have fought the and now. We are all the rare breed that defend liberty so that the rest may sleep under the blanket of freedom! Makes this ol’ Doc feel proud. head that ever was, is , or will be!. Happy Birthday Marines. Its great to be part of such a brotherhood. Gen Amos, good to see you, your old friend. Happy Birthday, Marines. It was a pleasure being able to serve with you in the Gator Navy. I come from a very proud tradition and am very proud to say that I grew up in the marines. When some of my other military friends hung their heads as if to be ashamed that they grew up in the other branches, I had my head held high and gave thanks that these are my roots. Semper fi! Happy Birthday to all Marines. Lets remember our fallen Marines and support our active Marines. Strenght and Honor to all my brothers. Semper Fi Do but never die. Faithful to God, Family, Country and Corps. May God always Bless our troops that fight the good fight for freedom. God Bless and May we all seek Eternal life after death in Christ to live forever. Marines never die they just live a new life in a new battlefield. I was lucky enough to have served in the 1st Bn 3rd Marines communications platoon with one of the most Honorable and hard charging Marines I have ever met. Sgt. Mathew Garvey is a poster Marine and was all the way to the end.